Shop4teams offers a fantastic variety of in-stock Youth Basketball Uniforms, Basketball Jerseys and Basketball Shorts from the brands you love like from Teamwork Athletic Apparel, Holloway, Augusta Sportswear and High Five. 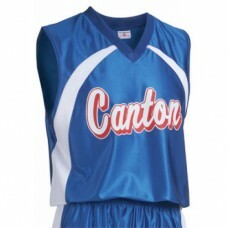 All our blank in-stock uniforms are available to ship same day if ordered by 12:00 CST. time. Size chart Color side is 100% polyester wicking knit * White side and inserts are 100% polyest..
LIMITED QUANTITIES - Please call for availability !Size chart 100% polyester wicking knit with 100% .. Size Chart Badger size jock tag Double-nee.. Size chart Badger size jock tag 100% Po.. Size chart Contrast shoulder and side panel inserts .. Size chart Badger size jock tag Contras.. Size chart Each layer individually bottom hemmed for easy screening .. Size chart 100% polyester wicking smooth knit * Wicks Moisture * V-neck collar * Contra.. Size chart 100% polyester with Essortex Moisture Management Technology * Designed to be.. Size chart 100% polyester wicking knit * Wicks Moisture * Contrast color V-neck collar ..
LIMITED QUANTITIES ! Please call for availability ! Size chart One layer of 100% po.. Size chart Two layers of 100% polyester wicking knit. Fully reversible for wearing on eit.. Size chart 50% polyester/50% cotton jersey knit * Self fabric binding at neck and armhole..